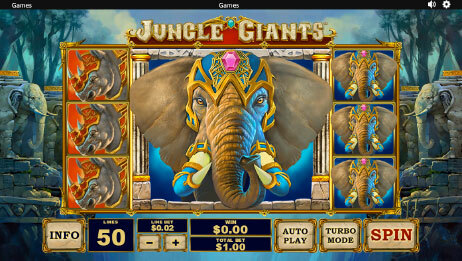 Jungle Giants at Fly Casino is an amazing new 50-line slot with 3X3 MEGA reels. Somewhat similar to RoboCop™ in terms of the 3X3 MEGA reels, Jungle Giants has a few fun differences and is really fun to play at Fly Casino. Themed in in a jungle-like setting, you are taken into a world of adventure with symbols on the reels include playing cards (A, K, Q, J and 10), hippos, gorillas, rhinos, elephants and buffalos. There’s also a wild which substitutes for all symbols. The Jungle Giants logo symbol fully covered on reels 2, 3 and 4, will trigger the Giant Free Games feature where you’ll receive 8 free spins. If get the same during the feature, you will get a further 8 free spins. You can retrigger an unlimited amount of free spins! Beyond getting the free spins, all symbols on reels 2, 3 and 4 are replaced with giant symbols (3×3) – all the animal symbols and wilds are also stacked on reels 1 and 5 to help you win huge. And, all 10-A symbols are removed for bigger winning potential! $300.00 Big Money Tuesday! From 00:00GMT until 23:59 GMT, all members are invited to receive a 75% bonus up to $/£/€300.00 on your deposit of just $/£/€30 or more or more.